New Microsoft search engine next week? Kumo in test - but will it be rebranded? Microsoft could be set to unveil its new search engine next week, according to reports in US broadsheet the Wall Street Journal. The Kumo project has been rumbling on within Microsoft for some time, as the company looks to replace the Live search engine - which has struggled against the might of Google - with something more successful. Next week sees the D: All Things Digital conference, and both the ever-reliable WSJ and the AllThingsDigital blog – two Rupert Murdoch properties – are suggesting that it will serve as the launch pad for Microsoft's new search engine. The principle behind Kumo, which has been tested internally for some time, is that it will organise results in a much friendlier way for the public – enabling them to find exactly what they want quicker than ploughing through pages of links. Of course, with Wolfram Alpha launching last week and Google showing off a raft of new search functionality including Google Squared, a response from Microsoft, and of course Yahoo, is perhaps overdue. Microsoft chief Steve Ballmer commented on the company's pursuit of search share back in March, insisting that merely letting Google corner the market was not an option. "Some people say 'why don't you just give up? ', said Ballmer then. "This is a huge opportunity – if you give up then you don't get back in the game. "We have good ideas; this is not going to change quickly but it's a market that deserves to have a few creative teams innovating. "We've got great talent in this area and a great opportunity to really differentiate, but we have incredible odds [against us]. "What's our strategy? We've got to make fast releases quickly. This is a product where we're turning new releases every six to nine months. "We have another significant release this spring and we're really pushing to get relevance in our algorithmic results." 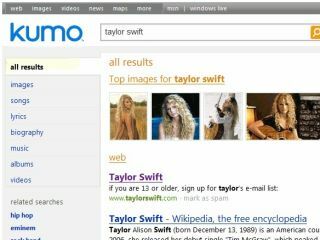 Microsoft has not commented on the latest rumours about Kumo – or whatever it chooses to brand its latest search product.